Mr. N. Ramachandran added another feather to his already illustrious cap as today he was conferred with Rashtriya Khel Protsahan Puruskar for 2011 by The President of India – Smt. Prathibha Devisingh Patil. At the packed ceremonial hall in Rashtrapati Bhawan today. For the dedicated, and hardworking Mr. Ramachandran this meant more than close to decade and a half of dedication to the sport of Squash Rackets. A sport which was played by Indian Military Officers, and handful others. Considered an elitist sport by most. In a country which is ravaged by Cricket it was always going to be difficult for RAMY as he is popularly known among friends. With his path laden with this reality Mr. Ramachandran took unto himself to move forward with purpose. 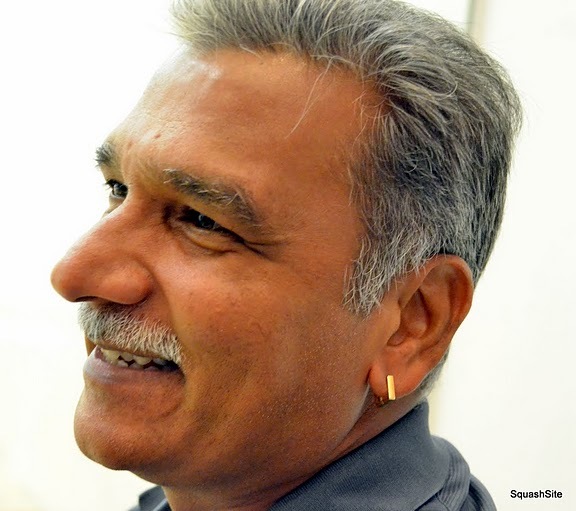 His vision has seen the emergance of the Indian Squash Academy in Chennai and a development program that has contributed to the game today finding a rightful place in the Indian Sports Arena. Squash has been played in India since the pre-war days. To a large extent it was introduced by the British forces that built squash courts in military cantonments and private clubs as an outlet for their sporting interests. In the early days squash had the following of a smattering few who were either from the forces, members of private clubs or children returning from studies abroad. It certainly fitted the name it was given at that time – a bourgeois sport. An organised activity for the promotion of the game was non-existent. Over time, however, things changed. The Squash Rackets Federation of India (SRFI) was formed to oversee the promotion and development of the sport in India. Needless to mention results did not rush in with a gush as a lack of systematic structure was posing unending problems. Non-existence of public facilities, lack of qualified manpower and public awareness of the game was pathetic. This is about the time Mr Ramachandran took reigns of the Association and after taking hold of the situation very methodically started working on the sport. About 5 years ago the SRFI forged ahead with some dynamic plans. Squash promotion, development and performance at all levels in India have escalated more in the last 10 years than in the last 50. 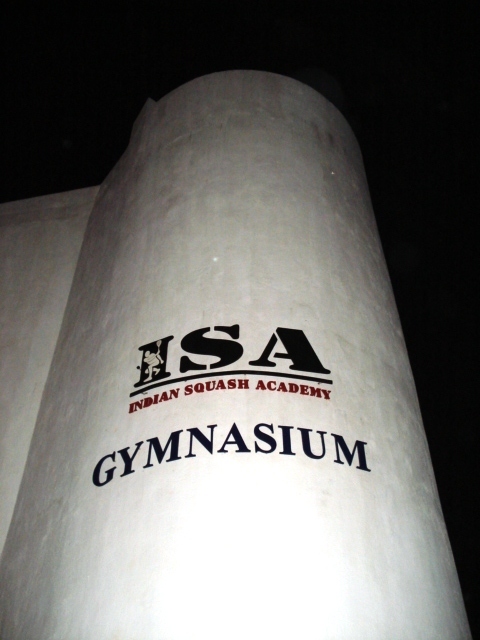 The presence of ISA has seen Tamil Nadu emerge as the most ‘squash active’ state in India mainly due to the work put in by the TNSRA and its governing board and the world class squash facilities. The Indian Squash Academy boasts of two complexes; one with 3 glass back rainbow courts and the other a state of the art centre with 4 glass back rainbow courts that are convertible to 2 doubles courts together with a Center ASB 4 sided all glass court which enables television coverage from all angles. The collective effort put in at the Academy under the supervision of World Class Coaches and trainers has seen the emergence of players like Ritwik Bhattacharya the first Indian Male or Female Squash Player to break into World Top 40. Following in his foot steps was another Indian Saurav Ghosal who went a few ranks above his contemporary to get into World Top 30 for Men’s. Saurav who has age on his side is likely to break into Top 10 very soon. If Men were performing well so were the women first it was a local girl from Chennai Joshna Chinappa who broke into Top 50 for Women. She is presently ranked 31st in the World. Following her was another local girl from Chennai – Dipika Pallikal who did one better than Joshna and is presently ranked 24 in the World. There are others in Harinder Pal Singh, Siddhart Suchde and many other emerging juniors knocking hard for a place in Top World Rankings like their seniors and contemporaries – Indian Squash suddenly is the most happening thing in the world. The Academy is ably staffed by a National Consultant Coach – Major Maniam from Malaysia. Major Maniam has been the coach of Nicole David the reigning World Women Squash Champion. Besides he is a household name in Malaysia for his admirable contribution to Malaysian Squash that has produced world ranking players in Nicole David, On Beng Hee and Alzan Iskander. Major Maniam is ably assisted by our very own Cyrus Poncha someone who the world has come to know for his admirable exploits as coach through his illustrious pupils. 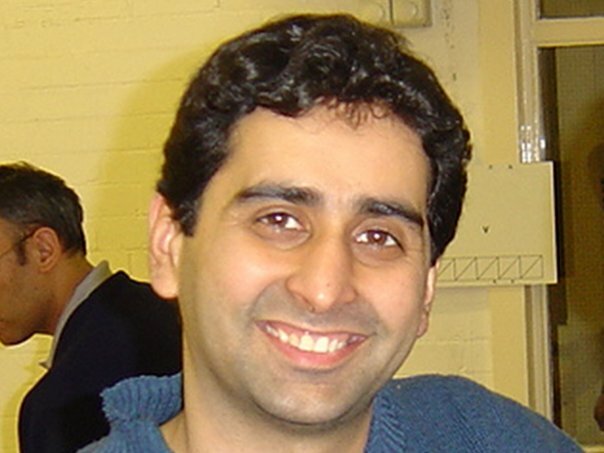 Cyrus incidentally is a recipient of the Dronacharya Award 2005 presented by the then president Shri APJ Abdul Kalam. Mr Ramachandran has already headed the Asian Squash Federation and a few years ago took the reigns of the World Squash Federation as its President. To know more about this please click here on our earlier post covering that event……… Ramachandran to Head World Squash Federation. S4H Unlimited blogs Congratulates the WSF President – Mr. Ramachandran and wishes him greater success in his next ambition of – Taking Squash into Olympics – a continued struggle of many squash players, fans and supporters whose weight his shoulders carry. 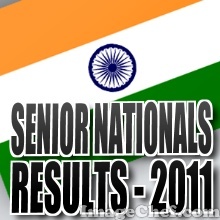 Please find enclosed details of both Senior as well as Junior Nationals for year 2011 as announced by SRFI. The Senior Nationals have been allocated to our home state of Uttar Pradesh and will be staged in Kanpur to be played late November early Deccember. You are required to forward your names, correct date of birth and contact details to your state / district bodies. Entry forms can be downloaded from the blog once they are received and available for uploading. All of you are requested to submit your entries to the District Association well in time for the entries to be sent to UPSRA for further consolidation and submissions. 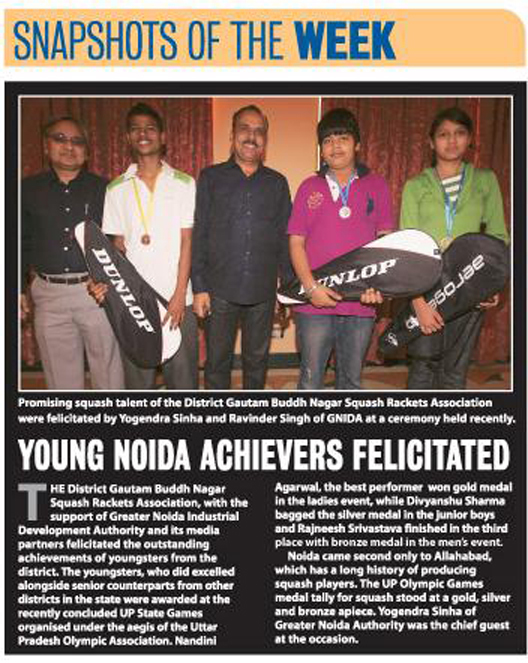 The District Gautam Buddh Nagar Squash Rackets Association with the support of Greater Noida Industrial Development Authority and its friends in both Electronic & Print Media are felicitating the outstanding achievements of players from the district in the recent U.P. State Games for Squash. Organized on behalf of the U.P. Olympic Association (Lucknow) and under the aegis of Uttar Pradesh Squash Rackets Association (Kanpur) the event saw our players return with some outstanding results. 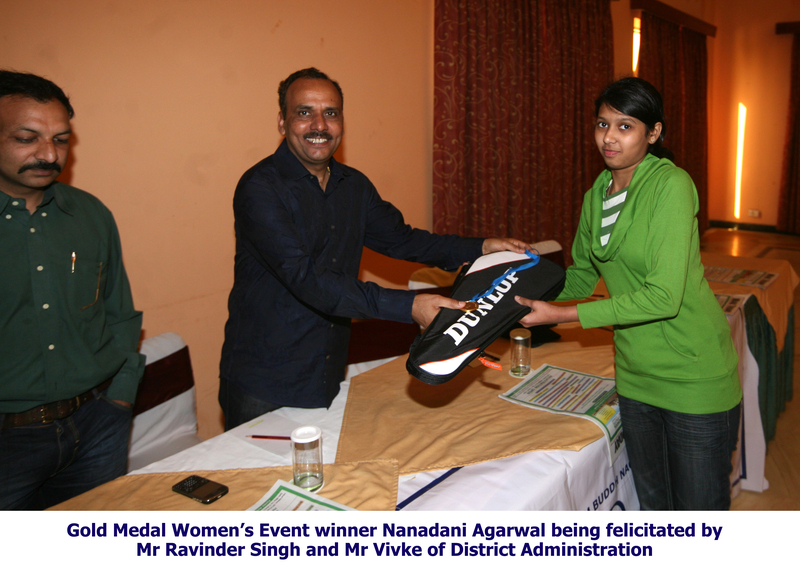 Ms. Nanadani Agarwal – Won the Gold Medal in the Ladies event. 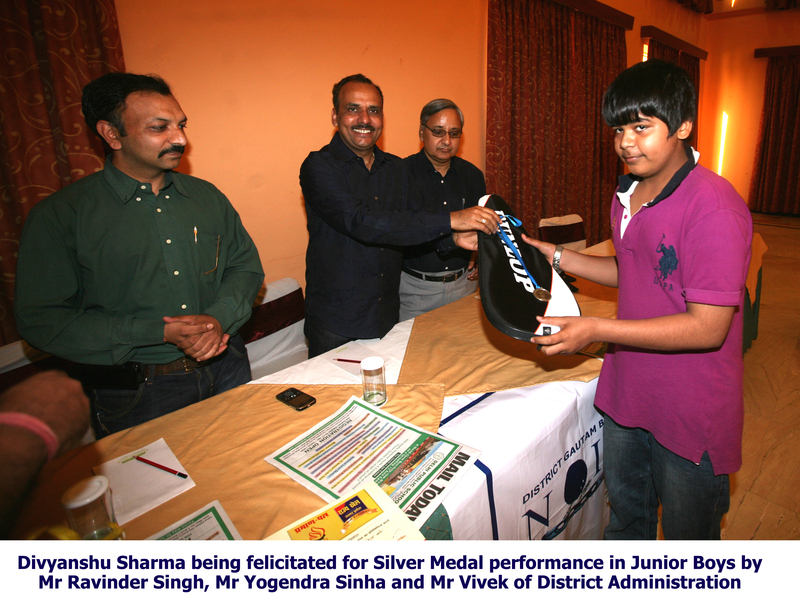 Master Divyanshu Sharma – Won Silver Medal in the Junior Boys. Master Rajneesh Srivastava – Won Bronze Medal in the Men’s event. 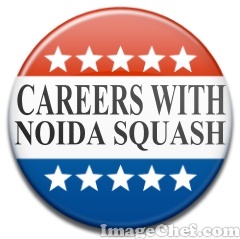 Noida came second only to Allahabad which has a long history of producing squash players. The U.P. Olympic Games Medal Tally for Squash stood as – 1 Gold, 1 Silver and 1 Bronze. Is extremely cheap to play with rackets costing less than Rs 800/-. Lack of public infrastructure is the biggest drawback for the sport in the district with squash courts only available in residential complexes or clubs. If this could be overcome Noida – which on the eve of Formula One is sitting on the threshold of making an International Mark in sports can produce world class players. Under the stewardship of the Chairman (DGBNSRA) – Mr. Anil Agarwal, the District Body continually keeps working hard at giving opportunities to our players to compete with the best and perform better. So much so, that the association has organized 3 tournaments in just the last 6-8 months. We would also like to thank our Patrons Jaypee Greens & Lotto Sports Italia (India) and all our friends in the Press for taking the extra step in ensuring news reaches out to the masses. We would like to thank you all for this voluntary service to not just the residents of the district but also to the nation at large. DGBNSRA would like to thank Mr Gurbir Singh (President of the Netball Federation of Inda), Mr Rajendra Singh General Manager Properties, Mr Yogendra Sinha Manager Marketing, Mr Vivek Goel, for taking time out from their busy schedules to honor local talent. Mr Ashish Narang Manager Marketing – Mail Today for facilitating the event and making sure the atheletes find a rightful mention in the media. Jaypee Lotto Italia – Dates SHIFTED !! DATES REVISED TO OCTOBER 01-04, 2010. 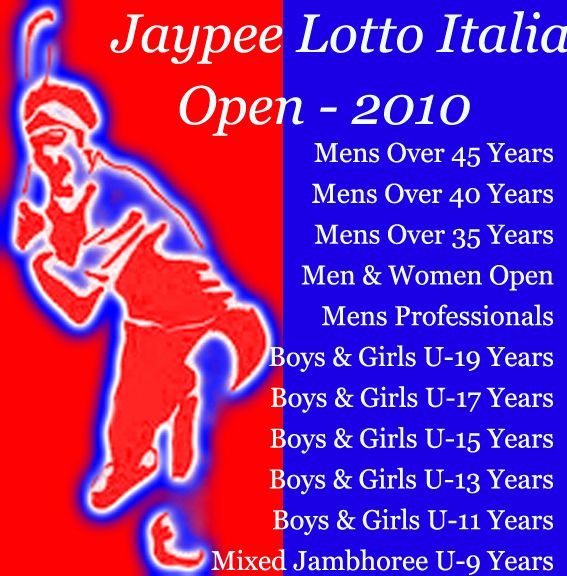 The District Gautam Buddh Nagar Squash Rackets Association hereby announces the shifting of the Jaypee Lotto Italia Squash Open Championship from September 17th – 19th (3 Days) as originally scheduled to October 01st – 04th (4 Days). DGBNSRA felt that this was necessary for all outstation players and would result in them deriving maximum benefit by visiting NCR. Visiting players will not only be able to paraticipate in the Jaypee Lotto Italia Championship but can also use their stay to drop in at the Commonwealth Games Squash Venue and watch some exciting International Competition. Enjoy playing at a world class facility @ Jaypee Integrated Sports Complex – Club Atlantis which houses six (6) airconditioned glass back courts made to international specifications. Stay at a YMCA – Our Accomodation Partners which provides airconditioned double rooms and subsidised meals only for visiting players and officials at affordable prices. Win PRIZES GALORE both ON & OFF the court. There is competition on the court and daily fun games off it where all are invited to show other skills be at mimicing, acting, singing, and whatever the contestants & organisers feel will be permissable for the occausion. Unwind and celebrate by being a part of the Tournament Dinner on October 04th, 2010 in some cherished company. See Men’s & Women World Champions along with other Eliete Players including our very own Champions at Commonwealth Squash Venue. Commonwealth Tickets start as low as Rs. 100 /- and can be booked online. 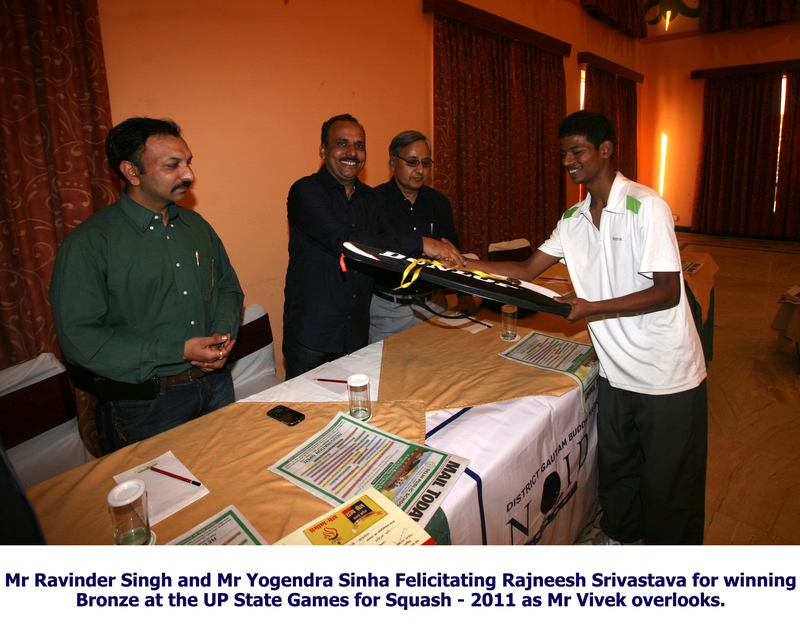 LAST DAY OF ENTRY – September 21st, 2010 – as per noatification received from Secretary Uttar Pradesh Squash Rackets Association (UPSRA). As Secretary of the District Association ( Noida and Greater Noida), I invite you and look forward to your presence with us at Greater Noida very soon and assure you of an experience that you will remember for a very long time to come. The Uttar Pradesh Squash Rackets Association together with Gautam Buddh Nagar Squash Rackets Association together with M/s Jaypee Green & Sports Life Style Pvt Ltd are proud to bring you three days of action in Greater Noida. The Uttar Pradesh Squash Rackets Association cordially invites you to its Annual Signature Squash Extravaganza – The Jaypee – Lotto Italia Open Squash Championship. 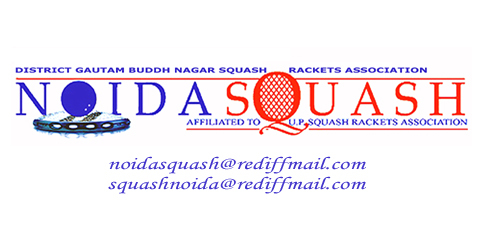 The event will be administered by District Gautam Buddh Nagar Squash Rackets Association. We at DGBNSRA are sending out invitations on behalf of UPSRA. On popular demand, this year we have added the master, seniors, opens and professional categories to the regular Junior age groups. So there is bound to be twice more exciting action and our under 19 boys and girls will get ample opportunity to display their skills in the Men’s & Women Open events together with older age groups who we feel still have a lot of squash in them. We all know Squash is a commonwealth sport with 5 medals at stake being close to New Delhi you will also get to see the absolutely brilliant structure that has been errected with 10 singles glass back courts and one all glass show court at Sri Fort Sports Comples. 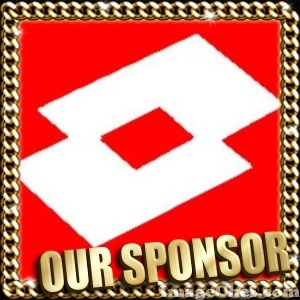 For more details on this please click on the following link….. While we will get to see all the Seniors showcase their respective skills for the benefit of the youngsters, DGBNSRA will continue to keep its focus on the development of junior squash players and ensure they go back after some healthy competition. Loosers-plates ensure you get to play more than one match in every age category and with permissions to play two categories most players are guaranteed at least 4 matches in the championship another trade-mark of the event. The tournament will continue to provide fair and healthy participation and continue to act as the final test event before the Junior Nationals that are held in October every year. So in case you or your ward plays squash – this is one event you must definately not give a miss since playing here will give you the much needed match-exposure and help you peak just in time for the Jr. Nationals. To download the entry form and Tournament Poster please click on the following links….. So friends here is looking forward to your participation and to some really good times come this September in Greater Noida. Day One & Day Two Results – Otters Open 2010!! Day one and day two saw most seeded players move except for a few matches that created minor upsets. Please click below to view results as they have been forwarded by the organisers…. The signatrue tournament of Mumbai gets underway on June 26th, 2010. According to the organisers the tournament has received close to 700 entries making it necessary for the organisers to look for an additional venue. The tournament this year will be played at Otters Club as well as Khar Gymkhana courts that are within 3 kms of the main venue.